Test yourself on any topic. Is there a better alternative to Drill Me? Is Drill Me really the best app in Teaching Tools category? Will Drill Me work good on macOS 10.13.4? Drill Me was developed for users who need a software utility to test themselves on any topic. 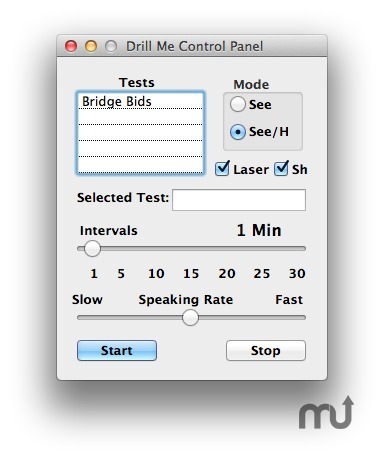 Drill Me comes with a default test of Bridge Bids and you can make your own tests. Questions and answers are displayed on top of the screen in bold black letters on a light yellow transparent film. You can set intervals between questions from 0 to 30 minutes. Users can try Drill Me in Demo Mode for 20 minutes per launch without registration. Drill Me is $10 shareware. Compatible with OS X 10.10's default security. Drill Me needs a rating. Be the first to rate this app and get the discussion started!